The wind kept blowing my pumpkin jack-o-lantern that is made of paper mache so I brought it inside and set it in between my potted plants. Hey peeps, what do you think of the second photo below? It's very windy and rainy here today. We are suppose to have rain the whole week so I doubt it if there would be any trick or treat for Halloween The city should have scheduled it last week when it was warm just like what Pittsburgh did. Christmas is fast approaching and it would be great if you can get something for free right? Here are some of the giveaways you can join. Few weeks ago, there was a community activity at our city dubbed as "Walk for Women... take a step against cancer" that was sponsored by some local organizations. I'd like to participate on this kind of event but I don't know anyone around here. I do my walking around my neighborhood instead but it would be great to find a buddy whom I can walk with everyday. A close friend of mine who is also my neighbor can't walk very far so she can't join me. My daughter is selling their school's annual fund raising candies. My neighbor took her around our neighborhood and she got a lot of orders! Well, the other day, our neighbor's grandson was selling some popcorn for their school's fund raising as well. The catalog that he brought has some delicious flavorings of popcorn. I was going to buy the pop corn kernels but I realized that I would need one of those popcorn machines to pop them. So I just ordered the ready-to-eat popcorn. Check it out here to see some selections of each type of popcorn machine if you are planning to buy one. Hey, you can put me on your Christmas gift list for this Christmas! Hahaha. Just kidding folks. Seriously though, I would love to have a popcorn machine because my kids and I love popcorn. I used to buy those pop corn packages that you can just pop in a microwave, and I think it just got old (hahaha). I can't wait till we get the popcorn that I ordered, it could spark the start of us getting hooked on popcorn again. I mean, we don't eat it often, just once in awhile when all of us sit together and watch a good movie. I would love to own a popcorn machine, so maybe someday I will buy one when the budget permits. On another note, you may visit any of the links provided above if you are looking for a good selection in a popcorn machine. It would make your movie night at home terrific. My kids would always eat the popcorn even before the movie was over. It's a fun snack and you can choose what flavor you want to serve for your kids and friends. Check them out. Can't think of a good title but "Old Fashioned." What are you thinking? Speak Out! The pumpkin farm that we visited last weekend was near the Pittsburgh airport so planes passing by was normal and a regular sight for guests in the farm. These two are military planes. Major holidays like Thanksgiving, Halloween, and Christmas are fast approaching. Some of you are already looking for deals to save money in buying the things that they want to give for Christmas and things that they need for the big occasion. Did you know that DealDash can save you money in doing your shopping? For those of you who doesn't know how DealDash works, here is a brief introduction to the site. This website is a risk-free alternative to penny auctions, it is honest and fair to all the bidders. It doesn't cost to become a member but you are required to purchase bid packs that comes in 60, 100, and more. Normal prices is 60¢ but there are also the 15¢ for frequent or regular bidder. There are three things that makes DealDash risk free. If you are a first time bidder and you did not win any auction, DealDash will return the bids from your first bid packs for free, so you ca use it again in bidding to other auction. If you bid in an item and did not win, they have a "Buy it Now" option where you can buy the item that you like at a regular price and get back the amount of bids that you spent in it. So, it is a win-win situation. Money Back Guarantee is a feature that would ensure bidders to get the money you spent in an item if in any reason, you are not satisfied with it. DealDash will return the money without any question ask. Try DealDash risk free today, just visit any of the links provided above. Lowe's has their plants on sale a couple of weeks ago. I bought some indoor plants for 1.69 each, it's amazing how prices can change. During the summer time, these plants are priced at 15.99 each. Don't these photos look like an aquarium? I took pictures of the shadows I saw at the back of my potted plants sitting on a bench and this is what it came out. I like how it turned out. I call it my imaginary aquarium. "No one needs a smile as much as the one who has no smile to give", a quote taken from Nuggets of Wisdom booklet. It's nice to bring the color of the Fall inside your home. Please check out and join my Bed Cover Giveaway. 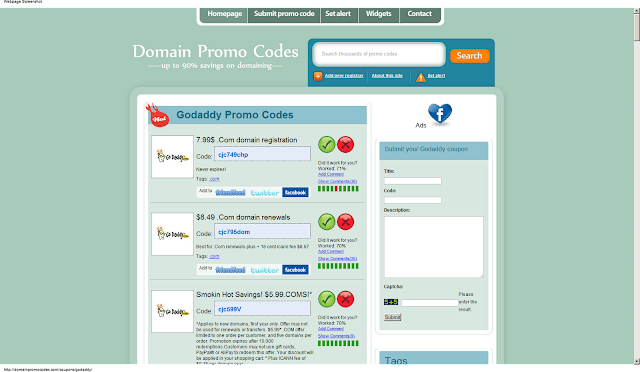 You can found Live Godaddy Promo Code List below this post if you want to save money in renewing your domain name or want to buy a new domain from Godaddy. This website is pretty generous this year to bloggers like me who pays for our own domain. You can also click the Godaddy Promo Codes through the image I have provided in this post. You can save to uo tp 20% off through using the Domain Promo Codes available at their site or you can automatically copy it here from my post. As a blogger who pays for our own domains, it is extremely helpful to find live codes like these because not all hosting companies offer discounts. How about a battery operated taranchula in the door, would it scare you? My sister in law made this paper macvhe pumpkin and gave it to us few years ago. This has light inside. It's been a month since I switched back my main blog to its old url. My main agenda in switching it back is the page rank that it has. It's domain used to have a higher page rank until Google took it back, since then, it remains at it's 0 PR which isn't helping with my online gig and that's the reason why I chose to switched back. So far, it is working good and I am enjoying it. I am thinking of transferring it to wordpress hosting just in case the PR goes away again. For now, I will keep it where it is being hosted. I was looking at the Squash Host's supported hardware and software and found some very reasonable prices on their domain prices. You can view their world class hosting by visiting www.Squashhost.com and browsing their hosting features. Squash Host not only provide a reliable web host for wordpress blog but they also provide Joomla CMS, a photo gallery software, and hosting plan that is perfect for small business website or big e-commerce store. Their hosting features include free domain name, marketing tools, website builder, and free one click scripts that you can use for your website. Some of their features are very new to me which I find very interesting. The services they provide includes hosting which starts at a low price of $3.25 only. They also have Virtuozzo VPS, Semi Dedicated, and Dedicated Server. They offer 30-day money back guarantee, they also guarantee 99.9 uptime and a 24/7 quality support. So if you are planning to build a website for your business and you need a professional help to effectively set up your website, just check out the company I have mentioned above. Starting a website is not easy especially if you don't have any experience in setting it up so a professional help surely is a big tool in achieving a successful set-up. I would like to thank Toe Juice for sending me these essential products that we could use at home. Cold season has rolled in at our side of the world so it is extremely important that I keep my children clean at all times so they would get sick. The soothing sanitizer would be handy when we are out of home and the Toe Juice can help sooth and relieve cracked feet which is very common during winter times. You can buy these products at Walgreens or you can get a free bottle by visiting the link I have provided in this post. Thanks once again, Toe Juice! One of the things that is worrying us is the carpet in our kids bedroom that got wet with leakage from a couple of year ago's winter. We are worried that it has mold under it and it could be detrimental to the health of our children. We wanted to rip it off but then we don't have the budget to replace it yet. We have steamed it and made sure that it was clean but we don't know for sure if it gotten rid of everything so we are still worried about it. Anyhow, I was looking at the services of Green Choice Persian rug cleaning New York online and learned about their environmental and health friendly way of cleaning carpets through using their organic products. As a parent, it is always my intention to use things that are beneficial for my children and organic cleaning products is always a plus. Green Choice provide green rug cleaning services that is not only nondepartmental friendly but is also great but is also good for the health of the home owners. If you live in New York and would want to check out their services, just visit the website by clicking the link I have provided in this post. These were taken when we looked at the Victorian house for sale last weekend. This is at their backyard which I really really. I can almost see us living there, the problem is the price of the house lol. The two photos at the bottom were taken last Sunday. This is not the church where we go but we drove by it when we fetched our daughter. One of her friends invited her over to their home for a playdate after church. "For me optimism is two lovers walking into the sunset arm in arm. Or maybe into the sunrise - whatever appeals to you. " This little guy is a regular visitor at my FIL's porch. He watches my FIL from the sidewalk and when he sees that he puts peanut, he runs towards the porch and grab his treat. This is his first trip. His second trip. Even if we are watching by the door, he doesn't care. He comes and grab his peanuts lol. Look how he stretches his short legs when he leaps in the air .